The prison population in the United States has been growing steadily for more than 30 years. The Bureau of Justice Statistics reports that since 2000 an average of 680,000 inmates have been released from state and federal prisons and almost 5 million ex-offenders are under some form of community-based supervision. Offender re-entry can include all the activities and programming conducted to prepare ex-convicts to return safely to the community and to live as law-abiding citizens. Some ex-offenders, however, eventually end up back in prison. 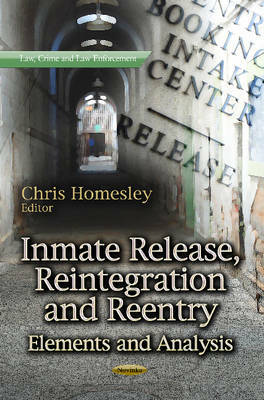 This book examines the key elements in inmate release and offender re-entry, with a focus on correctional statistics, reintegration into the community, and recidivism.